Increasing age is associated with the development of CD8+ T cell clonal expansions (TCE) that can dominate the peripheral T cell repertoire and interfere with immune responses to infection and vaccination. Some TCE are driven by chronic infections, consistent with dysregulated outgrowth of T cell clones in response to persistent antigenic stimulation. However, a second class of TCE develops with age in the absence of chronic infections and is poorly understood in terms of origin or Ag dependence. In this study, we present evidence that Ag-specific TCE develop at high frequencies from conventional memory CD8+ T cell pools elicited by nonpersistent influenza and parainfluenza virus infections. Putative TCE occurred in both the central- and effector-memory CD8+ T cell populations and did not require Ag for their maintenance. In addition, they were similar to normal memory T cells in terms of phenotype and function, suggesting that they develop stochastically from the memory T cell pool. These data suggest that memory T cell pools become progressively dysregulated over time and this may have a significant impact on immune responsiveness in the aged. Aging is associated with the progressive dysregulation of the immune system and a general decline in immune responsiveness to infection and vaccination (1, 2, 3, 4). One feature of this dysregulation is the appearance of CD8+ T cell clonal expansions (TCE)3 (3), which can represent up to 90% of the peripheral T cell repertoire (5, 6, 7, 8, 9, 10, 11). TCE in humans strongly correlate with seropositive responses to chronic virus infections, such as cytomegalovirus, suggesting that persistent antigenic stimulation drives these expansions (12, 13). However, TCE have also been found in the apparent absence of chronic infections leading to the suggestion that they can be classified into two hypothetical groups that are either dependent or independent of chronic antigenic stimulation (14). Putative Ag-independent TCE have been found in mice that have not been infected with any known pathogen and typically express receptors for cytokines that are involved in CD8+ T cell homeostasis, namely CD122 (IL2Rβ/IL15Rβ) and CD127 (IL7Rα). However, none of these TCE have been shown to express T cell Ag receptors specific for any defined Ag and, therefore, it is not known whether they are derived from naive, memory, or activated T cells. In this study, we analyzed mice that had recovered from intranasal Sendai or influenza virus infections and show that Ag-specific TCE progressively develop as the mice age. These expanded populations of T cells are indistinguishable from normal memory T cells in terms of phenotype, function, and their capacity to persist in the absence of Ag. Together these data suggest that that TCE develop stochastically from the existing memory T cell pool. Female C57BL/6 and B6.SJL-PtprcaPep3/BoyJ (CD45.1) mice (The Jackson Laboratory) were housed under specific pathogen-free conditions. Sendai virus (Enders strain) and influenza virus x31 (H3N2) were grown, stored, and titered as previously described (15). Mice (8–10 wk) were anesthetized by i.p. injection of 2,2,2-tribromoethanol (200 mg/kg) and infected with 250 50% egg infectious doses of Sendai virus or 300 50% egg infectious doses ×31 virus (15, 16). All animal studies were reviewed and approved by the Trudeau Institute Institutional Animal Care and Use Committee. Peripheral blood (100–200 μl) was obtained by nicking the tail vein and diluted 1:2 in HBSS containing 10U/ml heparin (Sigma-Aldrich). Peripheral blood leukocytes were purified by density-gradient separation with Lympholyte-M (Cedarlane Laboratories). Single cell suspensions were obtained from the spleen by mechanical disruption and straining through nylon mesh. Isolated cells were stained with PE- or allophycocyanin-labeled tetramers specific for the Sendai virus nucleoprotein epitope (Sen-NP324–332/Kb), influenza nucleoprotein epitope (Flu-NP366–374/Db), or influenza acid polymerase (Flu-PA224–233/Db) for 1 h at room temperature. All MHC class I-peptide tetramers were generated by the Trudeau Institute Molecular Biology Core. Tetramer-labeled cells were stained with Alexa405-, FITC-, Alexa488-, PE-, PerCP-, PE-Cy7-, allophycocyanin-, or allophycocyanin-Alexa750-conjugated Abs for 30 min on ice before flow cytometry. mAbs specific for CD8, CD44, CD45.1, CD45.2, CD62L, CD69, CD25, CD49d, CD127, and various Vβ Abs were purchased from either BD Biosciences or eBiosciences. Alexa405-conjugated Abs were purchased from Caltag Laboratories. Samples were run on either a FACSCalibur cytometer (BD Biosciences) or CyAn ADP (DakoCytomation). All data were analyzed with FlowJo software (Tree Star). Spleens were harvested from C57BL/6 (CD45.2) mice infected 20–25 mo previously and from naive B6.SJL-PtprcaPep3/BoyJ (CD45.1) mice as a source of APC. Single cell suspensions of splenocytes were prepared as described above. Splenocytes (0.5 × 106/well in 96-well U-bottom plates) from CD45.1 mice were pulsed with 1 μg Sendai virus NP324–332 peptide, influenza virus NP366–374 peptide, or PMA/ionomycin and were mixed with an equal number of CD45.2 splenocytes. Cells were incubated for 5 h in the presence of 10 μg/ml brefeldin A and 10U/ml IL-2, washed, and stained with mAb for CD8 and CD45.2 for 20 min. Cells were fixed with 2% paraformaldehyde for 20 min at room temperature, followed by permeablization with 0.1% saponin/1%FBS/HBSS for 10 min at room temperature. Cells were stained with mAb for IFN-γ and TNF-α in perm buffer for 30 min on ice, and washed twice. Samples were run on a BD Biosciences FACSCalibur flow cytometer and data were analyzed using FlowJo software (Tree Star). Total RNA was extracted from ∼5.5 × 105 sorted cells using an RNeasy Mini kit (Qiagen) and eluted in a volume of 30 μl of DEPC- treated water. Total RNA was then treated with TURBO DNA-free Kit (Ambion) to eliminate any traces of genomic DNA. Using the RETROscript kit (Ambion), cDNA was synthesized from the DNase-treated RNA, in a 40-μl reaction following the manufacturer’s instructions. Spectratype analysis was conducted essentially as previously described (17). Primer sequences for mouse Vβ3.1 and Cβ segments were synthesized at Integrated DNA Technology. cDNA (1 μl) was added to a final 50-μl mixture containing 5 μl of GeneAmp 10× PCR Buffer II (Applied Biosystems), 0.2 mM dNTP mix (Invitrogen Life Technologies), 1.5 mM MgCl2 (Applied Biosystems), 10 pmol of 5′ Vβ3.1 primer (CCTTGCAGCCTAGAAATTCAGT), 10 pmol of 3′ Cβ primer (CTTGGGTGGAGTCACATTTCT), and 1.25 U of AmpliTAQ Gold DNA polymerase (Applied Biosystems). PCR was run as follows: 10 min at 95°C, 35 cycles at 94°C for 45 s, 60°C for 45 s, and 72°C for 1 min, with a final extension at 72°C for 7 min. Two microliters of the PCR products were then used as template for an elongation reaction using a 6-FAM-labeled 3′Cβ primer in a 50-μl reaction. PCR was conducted as follows: 10 min at 95°C, 10 cycles at 94°C for 45 s, 60°C for 45 s, and 72°C for 1 min, with a final extension at 72°C for 7 min. PCR products (1 μl) from run-off reactions were mixed with loading buffer containing GeneScan 500 ROX size standard (Applied Biosystems) and denatured at 95°C for 2 min. Samples were then applied to an ABI Prism 310 Genetic Analyzer (Trudeau Institute Molecular Biology Core Facility). GeneScan software (Applied Biosystems) was used to analyze the data. The Vβ3.1-Cβ PCR products were purified using the QIAquick PCR purification kit (Qiagen) and sequenced with 5 pmol of sense Vβ3.1 primer on an ABI Prism 310 Genetic Analyzer. 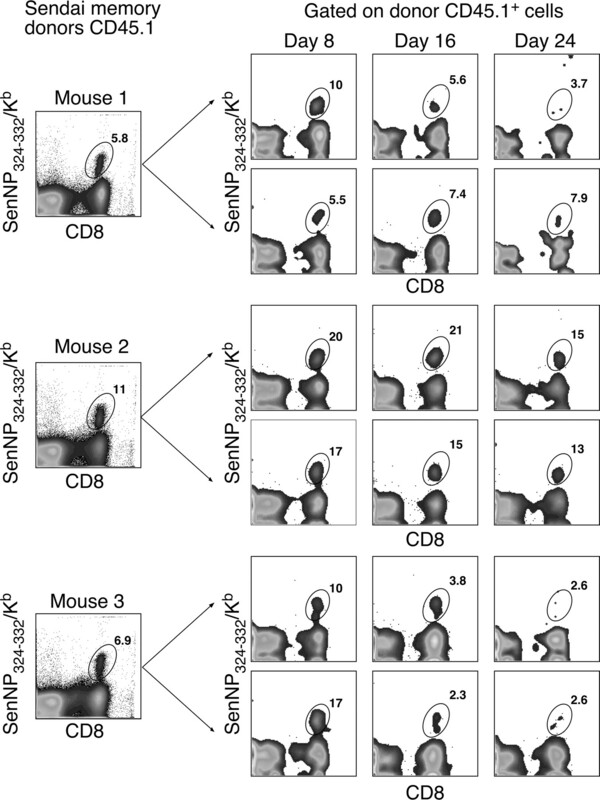 Single cell suspensions of splenocytes were obtained from CD45.1 mice that had recovered from an intranasal Sendai virus infection (20 mo postinfection). Cells were plastic adhered and then panned on Ig coated plates for 1 h at 37°C. Nonadherent cells were collected, counted, and divided equally into 2 aliquots and 2 × 106 cells were adoptively transferred via tail vein into two naive C57BL/6 (CD45.2) recipient mice per donor. Recipient mice were bled via tail vein on days 8, 16, and 24. Collected blood was lysed with ammonium chloride buffer, and stained with Sendai NP324–332/Kb tetramer, and mAb specific for CD8 and CD45.1. Single cell suspensions of splenocytes were obtained from mice that had recovered from an intranasal Sendai virus infection (20 mo postinfection) and showed either normal or high frequencies of Sen-NP324–332/Kb-specific T cells. Isolated cells were labeled with 2.5 μM CFSE, washed twice with PBS, and then cultured in vitro in the presence of irrelevant (influenza NP366–374) or cognate (Sendai NP324–332) Ag with no additional cytokine, 10 U/ml IL-2, or 100 ng/ml IL-15. On day 3 of culture, collected cells were stained with Sendai NP324–332/Kb tetramers and mAb specific for CD8 and CD44. Ag specific cells were subsequently analyzed for CFSE expression by flow cytometry. To investigate the impact of increasing age on memory CD8+ T cell pools, we analyzed C57BL/6 mice that had recovered from an intranasal Sendai virus infection. In this model, infectious virus is cleared within 10 days and there is no evidence of Ag persistence beyond a few weeks (15, 18). Peripheral blood was collected at various times postinfection (p.i.) and analyzed by flow cytometry to determine the percentage of memory CD8+ T cells specific for the immunodominant Sen-NP324–332/Kb epitope. As shown in Fig. 1⇓A, ∼2–20% of the memory (CD44+) CD8+ T cells in the circulation were specific for the Sen-NP324–332/Kb epitope at 1–3 mo p.i. The frequencies of Sen-NP324–332/Kb-specific T cells appeared to be generally reduced at 6 mo p.i. (excepting one mouse), but then increased again by 19–20 mo p.i. with two animals expressing extremely high frequencies (30 and >69%) of Sen-NP324–332/Kb-specific CD8+ T cells. Further analysis of the samples for CD62L expression to distinguish between central-memory (Fig. 1⇓B) and effector-memory (Fig. 1⇓C) T cells revealed progressive changes in the frequency distribution of Sen-NP324–332/Kb specific cells within both memory pools. This was especially apparent in the CD62Lhigh central-memory subpopulation where the frequency of Sen-NP324–332/Kb specific T cells among central-memory CD8+ T cells ranged from 0.1–1.5% in all animals at 1–3 mo p.i., but then increased to a range of 0.1–27% at 19–20 mo p.i. (Fig. 1⇓B). 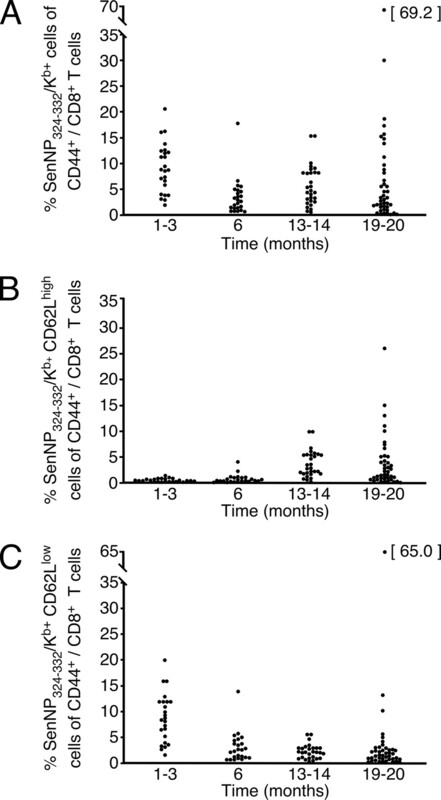 In contrast, the range of frequencies of Sen-NP324–332/Kb specific T cells appeared to generally decrease in the CD62Llow effector-memory CD8+ T cell pool over time (declining from 1.5–21% at 1–3 mo p.i. to 0.1–6% at 13–14 mo p.i.) (Fig. 1⇓C). This effect is due to the fact that Sen-NP324–332/Kb specific memory T cells switch from a predominantly effector-memory phenotype at 1–3 mo p.i. to a predominantly central-memory at 13–14 mo p.i (19). Despite the general loss of Sen-NP324–332/Kb-specific T cells from the effector-memory T cell pool over time, one mouse had a very high frequency of Sen-NP324–332/Kb-specific effector-memory T cells (65% of the effector-memory CD8+ T cell pool) at 19–20 mo p.i. Taken together, the emergence of high frequencies of Ag-specific memory CD8+ T cells with time after infection in some animals suggested that Ag-specific TCE had developed. The frequencies of Sendai NP324–332/Kb-specific CD8+ T cells in the effector- and central-memory T cell pools changes over time. A, The frequency of Sen-NP324–332/Kb-specific T cells within the total CD8+/CD44+ T cell pool in the peripheral blood. B and C, The frequencies of Sen-NP324–332/Kb/CD62Lhigh (central-memory) and Sen-NP324–332/Kb/CD62Llow (effector-memory) T cells within the total CD8+/CD44+ T cell pool in the peripheral blood. Each symbol represents an individual mouse from four cohorts at designated times p.i. Because TCE are defined as age-related expansions of individual T cell clones, we analyzed TCR Vβ usage among Sen-NP324–332/Kb specific T cells. We chose Vβ8 for these analyses because it is the dominant TCR Vβ element used in the CD8+ T cell response to Sendai virus (20) and there is an Ab (F23.1) able to detect all three Vβ8 family members. TCE would either reduce or increase the frequency of Vβ8 usage among the Ag specific T cells present in the blood. As shown in Fig. 2⇓B, at 1–3 mo p.i., the frequency of Sen-NP324–332/Kb specific T cells (among total CD8+ cells) in the blood was 1–4% and the frequency of Vβ8 expression by these cells varied between 5 and 40%. At 19–20 mo p.i. (Fig. 2⇓D), several of the mice presented with high frequencies of Sen-NP324–332/Kb specific T cells. In two of these cases (18 and 41% Sen-NP324–332/Kb specific), increased frequencies were correlated with an almost complete absence of Vβ8 staining. These data suggest that the Sen-NP324–332/Kb specific T cells in these two mice include either mono- or pauci-clonal expansions. High frequencies of Sen-NP324–332/Kb-specific T cells correlate with outlying levels of Vβ8 expression. Symbols in A and C represent data from the peripheral blood of individual young (A) or aged (C) mice. The open symbols in C indicate those mice in which the percentage of Vβ8-positive cells among Sen-NP324–332/Kb-tetramer negative cells was ± 2 SDs from the normal frequency observed in young mice. Symbols in B and D show the frequency of Sen-NP324–332/Kb-positive T cells (among CD8+ T cells) in young (B) and aged (D) mice and the percentage of these cells that were Vβ8-positive. Data are derived from the same studies described in Fig. 1⇑. We also analyzed the frequency of TCR Vβ8 usage among tetramer-negative cells from the same panel of aged and young mice. As indicated in Fig. 2⇑, A and C, there was a substantial increase in the range of Vβ8+ usage in aged mice suggesting the development of TCE in this pool. Using the young mice as a standard, ∼75% of aged mice expressed Vβ8 frequencies that were greater than two SDs outside the normal range of Vβ8 usage in young mice and were therefore considered potential TCE (indicated as open symbols in Fig. 2⇑C). The majority of these potential TCE expressed an effector memory phenotype, although a few expressed a central memory phenotype. To confirm that the expansions of Sendai NP324–332/Kb specific cells in aged mice were indeed TCE, we analyzed the phenotype and TCR Vβ usage of T cells from two mice (24-mo post Sendai virus infection) in more detail. One of these mice had shown strong evidence for a TCE (69% of the CD8+ T cells were specific for the Sen-NP324–332/Kb epitope; Fig. 1⇑) and the second was a control with no evidence for a TCE. As shown in Fig. 3⇓A, the frequency of CD8+ T cells specific for the Sen-NP324–332/Kb epitope in the first mouse had increased from 69 to nearly 90% of the memory CD8+ T cell pool since the original analysis, demonstrating that frequencies of Ag-specific T cells can change rapidly. Phenotypic analysis of these cells showed that they expressed an effector-memory phenotype (Fig. 3⇓A, middle frame). These cells were also uniformly CD49dhighCD122highCD127high and CD25lowCD69low, consistent with a previous report showing that TCE express markers associated with homeostatic proliferation and do not express recent activation markers, such as CD25 and CD69 (14). These cells also predominantly used a Vβ3+ TCR suggesting that they were clonal (Fig. 3⇓A, right panel and Fig. 3⇓B). 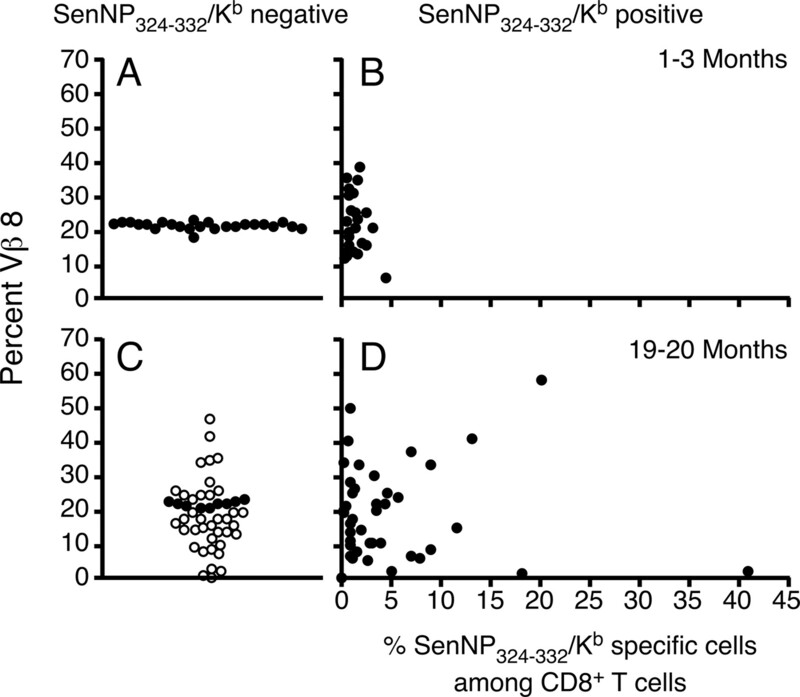 In contrast, the control mouse expressed a normal percentage of Sendai Sen-NP324–332/Kb -specific T cells (∼0.8% of the memory CD8+ T cell pool; Fig. 3⇓D) with a wide distribution of TCR Vβ usage (Fig. 3⇓E) and more variable CD49d expression (Fig. 3⇓F). Sen-NP324–332/Kb-specific T cell expansions in a mouse that has recovered from a Sendai virus infection. Two mice from the cohort of animals in Fig. 1⇑ were sacrificed at 24 mo p.i. A, B, and C, Show a phenotypic analysis of splenocytes from a mouse that had a high frequency of Sen-NP324–332/Kb-specific T cells and D, E, and F show a phenotypic analysis of splenocytes from a mouse that had a normal frequency of Sen-NP324–332/Kb-specific T cells. To confirm that the cells from the mouse with the apparent TCE were monoclonal, we performed spectratype and sequence analysis. As shown in Fig. 4⇓A, right panel, the Sen-NP324–332/Kb specific T cells in this mouse all had a single CDR3β rearrangement, indicated by the presence of a single peak in the spectratype profile. This contrasted starkly with the Gaussian distribution of Vβ3+ T cells isolated from the naive CD8+ T cell pool (Fig. 4⇓A, left panel). 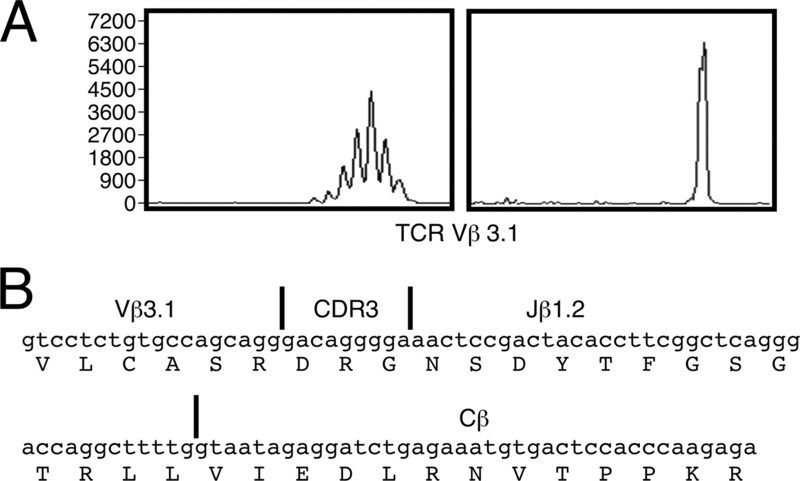 Direct sequencing of the single spectratype peak revealed a single TCR Vβ3-Jβ-Cβ sequence (Fig. 4⇓B). Thus, these data formally demonstrate that TCE can be generated in mice following recovery from an acute respiratory viral infection and demonstrate that TCE can develop from the virus-specific memory T cell pool. Sen-NP324–332/Kb-specific TCE are monoclonal. T cells from a control naive mouse or from the mouse with a Vβ3 expansion (from Fig. 3⇑) were isolated by sorting for CD44lowCD8+ T cells or for Sen-NP324–332/Kb tetramer+/CD8+ T cells, respectively. Total RNA was extracted from the sorted cells and spectratype analysis was conducted using primer sequences for mouse Vβ3.1 and Cβ segments. The left frame of A shows the Vβ3 spectratype of naive CD8+ T cells and the right frame of A shows the spectratype of the Sen-NP324–332/Kb-specific T cells. B, The nucleotide and amino acid sequence of the Vβ3.1-Dβ-Jβ-Cβ junction from the single spectratype peak generated from the mouse with the Vβ3 expansion in A.
TCE generated by chronic viral infections, and presumably by persistent antigenic stimulation, appear to be functionally impaired as they fail to produce effector cytokines upon restimulation in vitro (8, 9, 12, 13). To determine whether putative TCE generated in the absence of persistent Ag were responsive to specific stimulation, we assessed the capacity of Sendai virus-specific T cell expansions to produce effector cytokines in an in vitro intracellular cytokine assay. Five mice exhibiting elevated frequencies of Sen-NP324–332/Kb-specific T cells among total CD8+ T cells, ranging from 3.8 to 85.1% (compared with a normal frequency of <1%) were analyzed (Fig. 5⇓A). The mouse with the Vβ3 TCE described earlier was included in this panel (Fig. 5⇓A, mouse 4). The data show that in all mice examined, the Ag-specific T cells were fully functional in terms of IFN-γ and TNF-α production. A more detailed analysis of the cytokine response was performed by repeating the intracellular IFN-γ assay in the presence of titered doses of NP324–332 peptide to measure functional avidity (21). As shown in Fig. 5⇓, B and C, two T cell expansions exhibited functional avidities similar to those characteristic of normal Sen-NP324–332/Kb-specific memory T cells from young mice (half maximal peptide responses ranged from 5 × 10−3 to 5 × 10−5 μg for 90 day memory T cells and from 2 × 10−2 to 1 × 10−4 μg for the individual TCE). Taken together, the data suggest that Ag-specific TCE found after nonpersistent viral infections retain their ability to mount potent cytokine responses. Sen-NP324–332/Kb-specific T cell expansions produce cytokines in response to antigenic stimulation. Splenocytes from mice exhibiting Sen-NP324–332/Kb-specific T cell expansions of varying size (from Fig. 1⇑) were stained with Sen-NP324–332/Kb tetramers and CD8 (A, top row) or were stimulated with either 1 μg Sendai Sen-NP324–332 peptide pulsed splenocytes (A, middle row) or PMA/ionomycin (A, bottom row). The data in rows 2 and 3 of A show intracellular IFN-γ and TNF-α production in CD8-gated T cells. 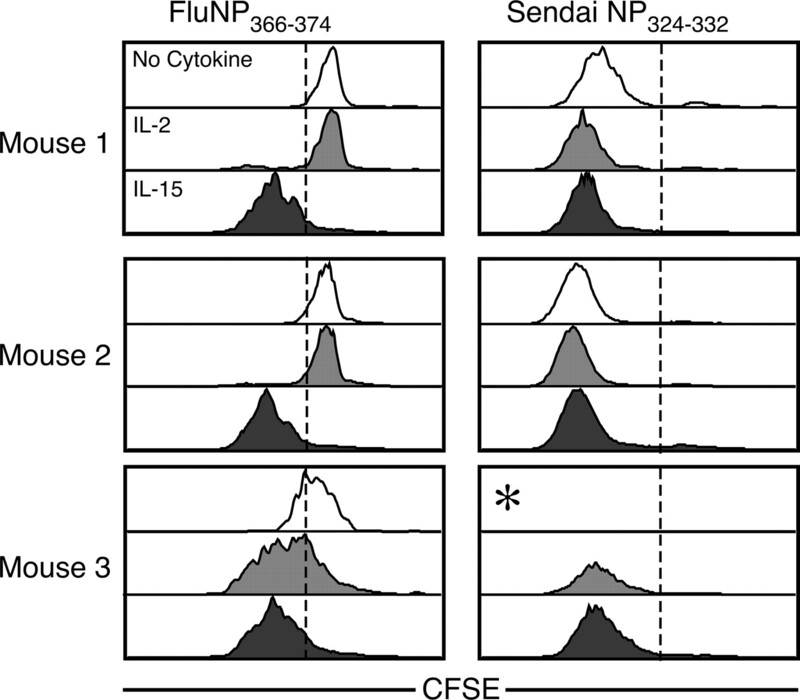 The capacity of Sen-NP324–332/Kb-specific memory T cells from three normal Sendai memory mice (B) and two Sen-NP324–332/Kb-specific T cell expansions (C) to produce IFN-γ is shown for a range of Sen-NP324–332 concentrations. The data in B and C are normalized to the maximal response for each titration. The data thus far demonstrate that functional TCE develop from normal Ag-specific memory CD8+ T cells and persist in the absence of persistent pathogen infection. Although these observations suggest that TCE are maintained in vivo by Ag-independent homeostatic mechanisms, we could not rule out that low levels of persistent Ag were required to maintain these cells. To address this possibility, we first analyzed the capacity of T cell expansions to proliferate in vitro in the presence of IL-2 or IL-15, cytokines that drive the homeostatic proliferation of memory T cells (Fig. 6⇓) (22). Splenocytes from one control mouse with the normal frequency of Sen-NP324–332/Kb cells (mouse 1) and two mice with greater than 20% Sen-NP324–332/Kb cells (of CD8+ memory cells, mice 2 and 3) were labeled with CFSE and then cultured in vitro in the presence or absence of the exogenous growth factors IL-2 or IL-15. Analysis on day 3 of culture revealed that Sen-NP324–332/Kb-specific T cells from all three mice proliferated vigorously in response to IL-15 in the absence of cognate Ag (Fig. 6⇓). In addition, T cells from one mouse with a putative TCE (mouse 3) also proliferated to IL-2 alone (the T cell expansion in this latter mouse was CD25+, data not shown). 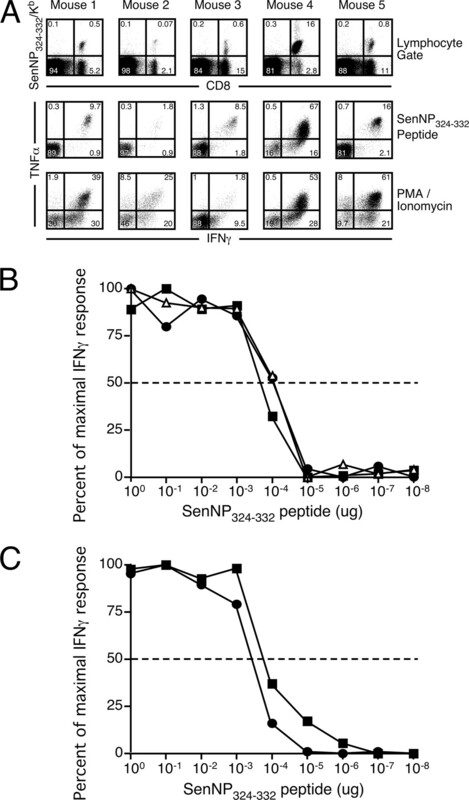 All of the Sen-NP324–332/Kb-specific T cells proliferated when cognate peptide (Sendai NP324–332), but not irrelevant peptide (influenza NP366–374), was added to the culture (although cells from the T cell expansion in mouse 3 underwent apoptosis unless IL-2 or IL-15 was also added) (Fig. 6⇓). Sen-NP324–332/Kb-specific T cell expansions proliferate in response to Ag or IL-15. Spleen cells from mice that either that had a normal frequency of Sen-NP324–332/Kb-specific T cells (mouse 1) or high frequencies of Sen-NP324–332/Kb-specific T cells (mice 2 and 3) were labeled with CFSE and then cultured in the presence of irrelevant (influenza NP366–374) or cognate (Sendai NP324–332) Ag in the presence or absence of IL-2 or IL-15. Data show the CFSE levels on Sen-NP324–332/Kb-specific T cells after three days in culture with the indicated conditions. ∗, No Ag-specific cells were recovered when the cells were stimulated with cognate peptide in the absence of exogenous cytokines. We next asked whether TCE could be maintained in vivo in the absence of Ag. Analysis of a cohort of B6.CD45.1 mice that had recovered from a prior Sendai virus infection (20 mo postinfection) identified three mice with high frequencies of Sen-NP324–332/Kb-specific T cells, all of a central memory phenotype. These mice were then sacrificed and ∼2 × 106 CD8+ T cells were transferred into each of two naive C57BL/6 (CD45.2) recipient mice. Peripheral blood from each of the recipients was then analyzed on days 8, 16, and 24 posttransfer. As shown in Fig. 7⇓, donor Sen-NP324–332/Kb-specific T cells persisted in the naive hosts throughout the experiment. In two cases, the frequency of donor Sen-NP324–332/Kb-specific T cells in the total donor pool was almost identical to the frequency at the time of transfer. In addition, all of the T cell expansions retained their original central memory phenotype throughout the experiment (data not shown). Together, the data confirm that T cell expansions are maintained in the absence of chronic Ag stimulation. Adoptively transferred Sen-NP324–332/Kb-specific T cell expansions persist in naive recipient mice. 4 × 106 CD8+ T cells from B6.CD45.1 mice that had high frequencies of Sen-NP324–332/Kb-specific T cells were i.v. transferred into naive C57BL/6 (CD45.2) recipient mice (two independent recipients per donor, each receiving 2 × 106 cells). Recipients were bled on days 8, 16, and 24 and the donor cells (CD45.1+) stained with Sen-NP324–332/Kb tetramer and CD8. Numbers indicate the percentage of Sen-NP324–332/Kb-specific donor T cells in the total donor pool. Although unlikely, it was possible that the development of Ag-specific TCE was a unique feature of Sendai virus infection and would not occur following acute infection with other pathogens. To address this issue, we analyzed a cohort of 15 mice that had recovered from an intranasal influenza x31 virus infection (20 mo p.i.). As shown in Fig. 8⇓A, two of these mice had significant expansions of CD8+ T cells specific for either the Flu-NP366–374/Db or the influenza acidic polymerase (PA)224–233/Db epitopes (mice 1 and 2, respectively) compared with a mouse without an obvious expansion (mouse 3) (23). Further analysis of these mice revealed that these expansions were both of a central memory phenotype and expressed TCR with highly restricted Vβ usage (Fig. 8⇓, B and C). The Flu-NP366–374/Db-specific expansion expressed Vβ8.3 (Fig. 8⇓D, mouse 1) and the Flu-PA224–233/Db-specific expansion expressed Vβ7 (Fig. 8⇓D, mouse 2). These particular Vβ elements have previously been reported to be expressed at high frequencies by T cells with these specificities (24, 25). Taken together, these data confirm that TCE development is not restricted to specific epitopes or pathogens. Ag-specific T cell expansions develop in mice that have recovered from an influenza virus infection. Fifteen mice were intranasally infected with influenza x31. Twenty months p.i., peripheral blood was screened to determine the frequencies of Flu-NP366–374/Db-specific and Flu-PA224–233/Db-specific T cells among CD8+ T cells (A). B and C, The specific staining profiles of mice that had a Flu-NP366–374/Db-specific T cell expansion (mouse 1), a Flu-PA224–233/Db-specific T cell expansion (mouse 2), and a mouse with no evidence of TCE (mouse 3). Top row of B and C, Flu-NP366–374/Db or Flu-PA224–233/Db tetramer staining. Second row of B and C, Vβ and CD62L expression on tetramer gated cells (indicated by the oval regions in the top rows). D, The expression of a specific Vβ and CD44 (Vβ8.3 for mouse 1 and Vβ7 for mouse 2) gated on the influenza-specific T cell expansion (Flu-NP366–374/Db for mouse 1 and Flu-PA224–233/Db for mouse 2). It is well established that CD8+ TCE develop in both humans and mice as they age. Although some TCE are driven by chronic infections, consistent with dysregulated outgrowth of T cell clones in response to persistent Ag presentation, others develop in the absence of chronic infection and are poorly understood in terms of origin or Ag dependence. In this study, we show for the first time that Ag specific TCE can develop from virus-specific memory cells in the absence of chronic infection. These T cell expansions are specific for several different epitopes and are elicited by different respiratory pathogens. Furthermore, these T cell expansions express many characteristics of normal memory T cells and are found in both the effector- and central-memory subsets. Importantly, these cells persist in the absence of persistent Ag and remain fully functional in terms of their capacity to proliferate and secrete cytokines in response to Ag stimulation. The incidence of TCE that can develop in these infection models is difficult to determine because of variation within the normal frequencies of Ag-specific T cells found after primary infection. However, analysis of the central-memory Sen-NP324–332/Kb specific T cell pool generated by Sendai virus infection suggests that TCE may occur at a high frequency. For example, using a relatively conservative cutoff of 5% for the normal frequency of Sen-NP324–332/Kb specific T cells in Fig. 1⇑B, it is apparent that putative TCE first appear around one year after infection and that the frequency of T cell expansions in the central-memory T cell pool is ∼20–40% (this is consistent with the observation that 13% of mice that recovered from an influenza virus infection exhibited T cell expansions with a central memory phenotype). Although it is difficult to do a similar calculation for the effector-memory T cell pool due to inherent variation in the percentage of Sen-NP324–332/Kb specific T cells, the incidence of effector-memory T cell expansions appears to be lower. Although these frequency estimates are based on peripheral blood samples, it should be noted that an analysis of splenic T cells after the animals were sacrificed yielded the same results (data not shown). Thus, the relative frequencies of Sen-NP324–332/Kb specific T cells and the central or effector memory phenotype of these T cell expansions was identical in the spleen and the peripheral blood. Together, these data suggest that TCE likely arise from the entire memory T cell pool rather than from a particular subset. This may also explain the development of TCE in mice that have not been deliberately exposed to a known pathogen, as substantial numbers of memory T cells are typically observed in specific pathogen-free mice. The mechanisms underlying TCE development are currently undefined. However, it seems unlikely that TCE develop due to any specific biological characteristics of a particular pathogen because two distinct viruses (Sendai virus and influenza A virus) were both shown to elicit T cell expansions. It is also clear from these studies that the maintenance of the T cell expansions does not depend on persistent Ag because both of these viruses are completely cleared by the immune response within 10 days of intranasal challenge with no evidence of Ag beyond six weeks of infection (26, 27). Furthermore, T cell expansions transferred into naive recipients were maintained at the same levels as normal memory T cells over several weeks. Thus, it appears that TCE are a natural outcome of the long-term homeostatic proliferation of the memory T cell pool. Because cell proliferation is asynchronous and individual clones may have slightly different proliferation rates, it might be expected that some clones would tend to overgrow the pool over time. The notion that Ag-specific memory CD8+ T cells do not require the continual presence of Ag for their homeostatic maintenance is consistent with the observation that TCE isolated from mice can be maintained in the absence of Ag by transfer into β2-microglobulin-deficient mice (8). The impact of TCE on host immunity is an important issue that is not well understood. It has previously been shown that TCE found in models of chronic infection are typically nonfunctional memory cells that reduce overall immunocompetence (8, 10, 12, 13). A recent analysis of TCE that expressed the same Vβ as a dominant portion of the normal response to HSV-1 was shown to have a Vβ-specific negative impact on the subsequent de novo response to HSV-1 (9). Conversely, the TCE described here, which are generated in the absence of persistent Ag, retain effector function and are likely to retain the capacity to mediate protective immunity to secondary challenge. However, the presence of these TCE severely compromises the overall size and, therefore, the diversity of the rest of the T cell pool. In one animal characterized in this study, a single TCE caused a 10-fold reduction in the size of the normal memory T pool. Thus, the presence of TCE, even functional TCE, may substantially reduce responsiveness to other pathogens. In conclusion, we show that Ag-specific TCE develop in mice infected with nonpersistent viruses and present evidence that they develop from the normal memory T cell pool. These observations have implications for vaccines in the elderly, because clonal outgrowths may limit the repertoire of T cells available to respond to new Ags (28). We thank Brandon Sells for help with flow cytometry; the MBCF for assistance with molecular analyses and tetramer production; and Drs. William Reiley, Shiki Takamura, and Eric Yager for critically reviewing the manuscript. ↵1 This work was supported by the National Institutes of Health (AI067967, AI058668, AG21600, and AI49823) and the Trudeau Institute. ↵3 Abbreviations used in this paper: TCE, T cell clonal expansion; p.i., postinfection. LeMaoult, J., I. Messaoudi, J. S. Manavalan, H. Potvin, D. Nikolich-Zugich, R. Dyall, P. Szabo, M. E. Weksler, J. Nikolich-Zugich. 2000. Age-related dysregulation in CD8 T cell homeostasis: kinetics of a diversity loss. J. Immunol. 165: 2367-2373. Wick, G., P. Jansen-Durr, P. Berger, I. Blasko, B. Grubeck-Loebenstein. 2000. Diseases of aging. Vaccine 18: 1567-1583. Miller, R. A.. 1996. The aging immune system: primer and prospectus. Science 273: 70-74. Haynes, L., J. Cambier, R. Fulder. 2005. Aging and immune function: summary of a workshop held at Trudeau Institute, Saranac Lake, NY. Mech. Ageing Dev. 126: 822-825. Callahan, J. E., J. W. Kappler, P. Marrack. 1993. Unexpected expansions of CD8-bearing cells in old mice. J. Immunol. 151: 6657-6669. Hingorani, R., I. H. Choi, P. Akolkar, B. Gulwani-Akolkar, R. Pergolizzi, J. Silver, P. K. Gregersen. 1993. Clonal predominance of T cell receptors within the CD8+CD45RO+ subset in normal human subjects. J. Immunol. 151: 5762-5769. Posnett, D. N., R. Sinha, S. Kabak, C. Russo. 1994. Clonal populations of T cells in normal elderly humans: the T cell equivalent to “benign monoclonal gammapathy”. J. Exp. Med. 179: 609-618. Clambey, E. T., L. F. van Dyk, J. W. Kappler, P. Marrack. 2005. Non-malignant clonal expansions of CD8+ memory T cells in aged individuals. Immunol. Rev. 205: 170-189. Messaoudi, I., J. Lemaoult, J. A. Guevara-Patino, B. M. Metzner, J. Nikolich-Zugich. 2004. Age-related CD8 T cell clonal expansions constrict CD8 T cell repertoire and have the potential to impair immune defense. J. Exp. Med. 200: 1347-1358. Posnett, D. N., D. Yarilin, J. R. Valiando, F. Li, F. Y. Liew, M. E. Weksler, P. Szabo. 2003. Oligoclonal expansions of antigen-specific CD8+ T cells in aged mice. Ann. NY Acad. Sci. 987: 274-279. Effros, R. B., Z. Cai, P. J. Linton. 2003. CD8 T cells and aging. Crit. Rev. Immunol. 23: 45-64. Khan, N., N. Shariff, M. Cobbold, R. Bruton, J. A. Ainsworth, A. J. Sinclair, L. Nayak, P. A. Moss. 2002. Cytomegalovirus seropositivity drives the CD8 T cell repertoire toward greater clonality in healthy elderly individuals. J. Immunol. 169: 1984-1992. Koch, S., R. Solana, O. Dela Rosa, G. Pawelec. 2006. Human cytomegalovirus infection and T cell immunosenescence: a mini review. Mech. Ageing Dev. 127: 538-543. Messaoudi, I., J. Warner, J. Nikolich-Zugich. 2006. Age-related CD8+ T cell clonal expansions express elevated levels of CD122 and CD127 and display defects in perceiving homeostatic signals. J. Immunol. 177: 2784-2792. Hou, S., P. C. Doherty, M. Zijlstra, R. Jaenisch, J. M. Katz. 1992. Delayed clearance of Sendai virus in mice lacking class I MHC- restricted CD8+ T cells. J. Immunol. 149: 1319-1325. Eichelberger, M., W. Allan, M. Zijlstra, R. Jaenisch, P. C. Doherty. 1991. Clearance of influenza virus respiratory infection in mice lacking class I major histocompatibility complex-restricted CD8+ T cells. J. Exp. Med. 174: 875-880. Pannetier, C., M. Cochet, S. Darche, A. Casrouge, M. Zoller, P. Kourilsky. 1993. The sizes of the CDR3 hypervariable regions of the murine T-cell receptor β chains vary as a function of the recombined germ-line segments. Proc. Natl. Acad. Sci. USA 90: 4319-4323. Usherwood, E. J., T. L. Hogg, D. L. Woodland. 1999. Enumeration of antigen-presenting cells in mice infected with Sendai virus. J. Immunol. 162: 3350-3355. Cole, G. A., T. L. Hogg, D. L. Woodland. 1994. 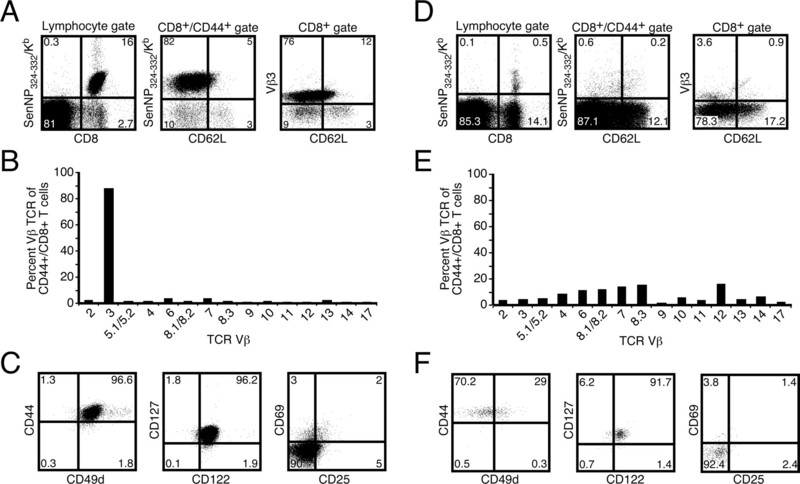 The MHC class I-restricted T cell response to Sendai virus infection in C57BL/6 mice: a single immunodominant epitope elicits an extremely diverse repertoire of T cells. Int. Immunol. 6: 1767-1775. Slifka, M. K., J. L. Whitton. 2001. Functional avidity maturation of CD8+ T cells without selection of higher affinity TCR. Nat. Immunol. 2: 711-717. Belz, G. T., W. Xie, J. D. Altman, P. C. Doherty. 2000. A previously unrecognized H-2D(b) -restricted peptide prominent in the primary influenza A virus-specific CD8+ T-cell response is much less apparent following secondary challenge. J. Virol. 74: 3486-3493. Deckhut, A. M., W. Allan, A. McMickle, M. Eichelberger, M. A. Blackman, P. C. Doherty, D. L. Woodland. 1993. Prominent usage of Vβ8.3 T cells in the H-2Db-restricted response to an influenza A virus nucleoprotein epitope. J. Immunol. 151: 2658-2666. Turner, S. J., G. Diaz, R. Cross, P. C. Doherty. 2003. Analysis of clonotype distribution and persistence for an influenza virus-specific CD8+ T cell response. Immunity 18: 549-559. Zammit, D. J., D. L. Turner, K. D. Klonowski, L. Lefrancois, L. S. Cauley. 2006. Residual antigen presentation after influenza virus infection affects CD8 T cell activation and migration. Immunity 24: 439-449. Woodland, D. L., M. A. Blackman. 2006. Immunity and age: living in the past?. Trends Immunol. 27: 303-307.